This recipe for a simple snacking chocolate banana cake is the perfect special treat for your family or friends. With Valentine’s Day just around the corner, I thought it would be appropriate to share this moist and tasty chocolate banana cake with all of you. As an added bonus, this chocolate banana cake recipe comes together in no time at all. With a time investment of just 15 minutes, you will be rewarded with the perfect dessert for your family and friends. You’ll see that once you make and taste this cake, you’ll be making it throughout the year. 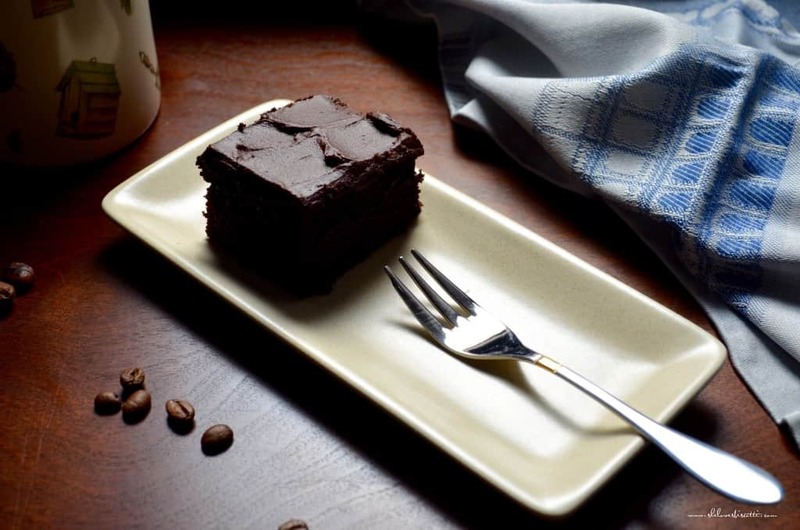 For those extra special occasions, the chocolate banana cake can be frosted with a chocolate ganache; otherwise, you can serve this simple snacking chocolate banana cake as is. Just like my recipe for moist and easy banana muffins, this chocolate banana cake is a great recipe to use up those ripe bananas that you might have hanging around the counter. I also love the fact that this recipe can make up to 20 servings and leftovers (if ever there are any) keep extremely well in the fridge. Nutrition Tip: For those special occasions when you are baking a cake, you can always try to reduce the total amount of sugar required. In most recipes, doing so will barely make a difference in taste. I will usually try to reduce the sugar a ¼ cup at a time. The goal is to achieve a product which is still great-tasting, but slightly less sweet. I’ve been making this chocolate banana cake for several years now. The recipe is from one of my favorite websites, Joy of Baking. There are tutorials and how-to videos that are extremely informative. And the recipes always turn out great. One of the reasons I love this chocolate banana cake recipe is that it uses an oil as the source of fat. That’s why you will find that for this reason, the batter is a little on the thin side. Not to worry, though, the end product has a light texture and the absolute perfect crumb! As far as desserts go, this recipe for Simple Snacking Chocolate Banana Cake is a delicious, decadent, and deceptively easy treat. Enjoy! Preheat oven to 350℉ (175°C) . Grease and flour (or use non-stick spray) a 9 x 13 inch pan. Sift together all the dry ingredients in a large mixing bowl. Set aside. In another medium sized mixing bowl, whisk together the eggs, mashed bananas, milk, oil, coffee, water and vanilla extract. Gradually add the wet ingredients to the dry ingredients and whisk together until combined. Bake in preheated oven for 35-40 minutes. (Ensure cake tester or toothpick comes out clean). Transfer pan on a wire rack where it can cool down before frosting (if using). Over medium heat, heat butter and cream. Bring to just under a boil. Immediately combine with the chocolate and let stand for about 5 minutes. LOVE THIS CHOCOLATE BANANA CAKE RECIPE? PIN IT TO YOUR CAKE BOARD! Mmm, this looks divine! Love the addition of that chocolate frosting – yummmm! Can’t wait to try it this recipe out! I, too, try to reduce sugar most of the time. And I also sub apple sauce for oil often. I love that this recipe has coffee and feeds a crowd! Baked it recently and it was great. A lovely recipe indeed. Thanks Maria. I love these ‘go to’ chocolate cake recipes that come together so quickly. I’m a fan of the Texas Sheet cake just for that reason with the cinnamon and chocolate. Thanks for giving me another option. I think my husband’s card group thinks I only know how to make one cake. LOL…I think we are all the same. Once we have a recipe that works, like this chocolate banana cake, we stick with it. Appreciate the comment. Have a great week-end. Just a question – should i use espresso or regular coffee…or does it not matter?? Also….i would like to use the applesauce option you mention! (I actually have homemade chunky applesauce!) So i should replace the full portion of oil by the applesauce? Baked this cake today with my mom! Wanted to let you know how much we loved it! Most impressive is the texture! The moistness in the sponge! Definately a keeper recipe !